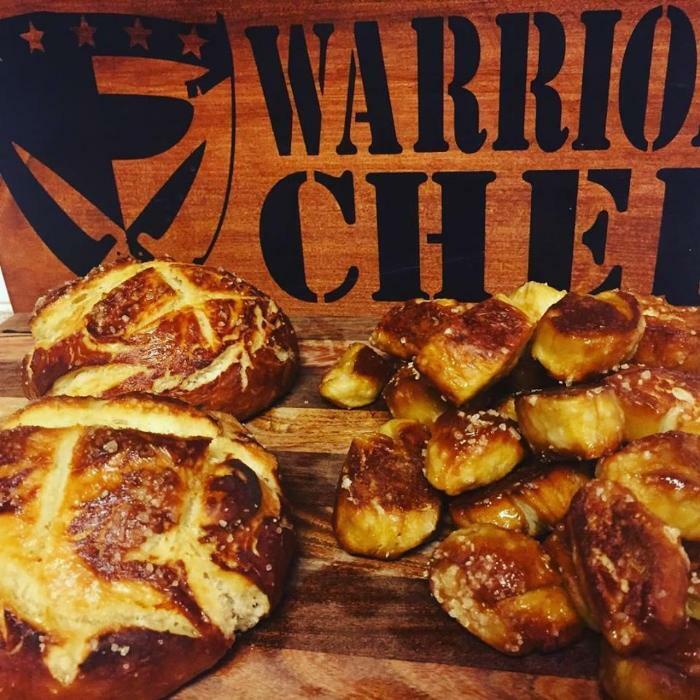 This pretzel bread is an excellent snack, or you can use it to make slider buns for a great burger! You won't buy storebought pretzel bread at the store again with this recipe! 1Combine yeast, water, and brown sugar in the bowl of a stand mixer with the dough hook. Let stand for 5 minutes until frothy. If you don’t see any activity throw it out and repeat with new yeast water and brown sugar. While yeast is proofing…melt butter in a microwave-safe bowl. Mix in milk and set aside. 2Once yeast is proofed, add milk & butter to yeast mixture and mix on low speed with dough hook until just combined. 3Combine salt with flour and mix with dough hook in 2 parts, until flour is fully incorporated. Knead with dough hook until the dough forms a slightly tacky, but firm ball, you may need to add a little more flour 1 TBS at a time, being careful not to make dough too sticky. 4Oil a large bowl, place the dough ball in the bowl, and cover with a damp towel in a warm place to let rise for one hour or until doubled in size. I put the oven on warm mode then shut it off. This helps speed things up a bit. 5Preheat oven to 400• F (remove your dough first if it’s in there) and bring the 4 quarts of water to a boil. When the water is boiling, SLOWLY add the baking soda being careful not to create a volcano! 6Remove the dough from the bowl and gently press out the air bubbles. 7This will make two loaves but you can quarter each loaf to make 8 baseball size balls. You can go farther and roll the balls into quarter size logs and cut them into about 1/2"- 1" pretzel bites. I'd opt for the latter but you have options! Do not let it rise at all here! Straight from forming the ball into the water. Drop half of the dough that you formed into the boiling water and boil for 60-90 seconds on each side. Drain the excess water from the dough and place it on an oiled baking sheet. 9Repeat until its all on the sheet. 10Cook the bread for 22-25 minutes, rotating the baking sheet once. 11Once removed from the oven, immediately brush the melted butter over the loaves to guarantee a soft crust.